Our latest review has been kindly written for us by Nicholas Dahlhoff from All Language Resources. 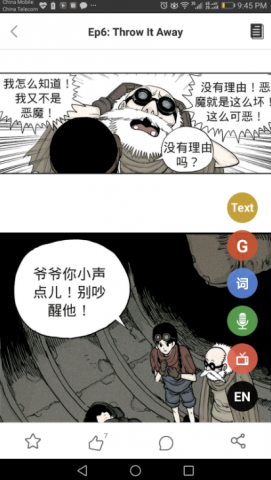 Manga Mandarin uses comics as a way to teach Chinese. With various comics at different difficulty levels, it’s easy to find something interesting to read. The addition of audio recordings, the ability to look up and save words, and grammar videos makes it a really interesting platform. Ease of Use: Takes a little bit of getting used to using, but fairly easy after that. Fun factor: Lots of fun, especially for those interested in Manga. Cost: Varies with different options and plans. Many people suggest reading manga as a great way to study Chinese. While I’ve never been particularly interested in reading comics, I can definitely see where they’re coming from. 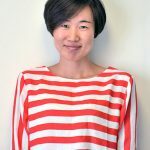 Manga Mandarin aims to utilize the benefits of studying Chinese through reading manga while getting rid of the impracticalities, as well as adding other benefits. Let’s see how well Manga Mandarin does. You’ll find that there is quite a lot going on at Manga Mandarin and you may not immediately know where to go and what to do. Level label – Comics are marked with a label that marks the suitable HSK level. This obviously makes things much easier to find appropriate content and it goes from level 0 up to level 6. Switch language – Clicking this button lets you quickly switch between English and Chinese text. Pronunciation and explanation – By clicking the dialog box, you’ll hear the audio spoken by a voice actor. Clicking the box twice will show you pinyin and translations. Dubbing – You can record yourself voicing the lines. Grammar video – After some of the lessons, there is a short video explaining important grammar or language points that you may have come across. Grammar – If you click the grammar button, you’ll find a brief description of the main grammar points found in the episode, as well as some example sentences. Even after going through the user guide, you may not be sure exactly where to go. On the main page, you’ll see recently updated Chinese comics at the top and the most popular ones below that. The problem is that the content is quite confusing to sort through. Clicking on the Category button makes things a bit easier. At the top of the page you’ll see options to sort by difficulty level or theme. Each Mandarin comic is labeled by HSK level. 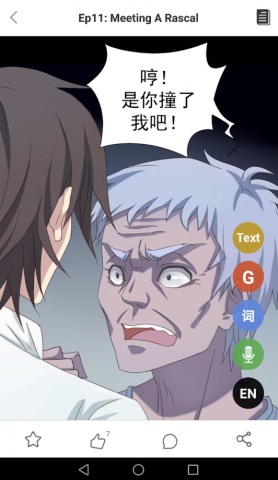 This Chinese comic is listed as HSK 4. There are currently 10 episodes that you can read through (they’re fairly short). I actually read the first five episodes a few months back but at that time, there was nothing more of this story to read. Similarly, every story that I read a bit of and began to get interested in, I’d hit a point where there was nothing more of it for me to read and new episodes were released too slowly, that I ended up getting bored and sort of forgot about the app. Obviously, the longer Manga Mandarin is around, the less this will be a problem as the content will build up. But, as the app is still fairly new, this is a potential annoyance that you’ll face. Reading through these Chinese comics are really enjoyable. The illustrations are fantastic. If you click on a word bubble, you’ll hear the audio of the text. Manga Mandarin did an excellent job here of finding skilled voice actors. The quality of the recordings really makes the experience so much better. 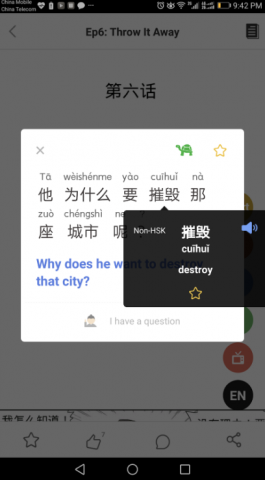 Double clicking on a word bubble shows the characters, pinyin, and translation. You can also play the audio at a turtle’s pace, save the sentence for later, or click on an individual word to listen to it, see the definition, or it save for later. These are really useful features to have. While there are occasional instances where I’ve tapped several times and had response problems, for the most part, tapping once vs tapping twice is rather effective. One annoying thing that hopefully gets fixed in the near future is the presence of various buttons on the right hand side of the screen. The vast majority of these, you won’t need to click on often at all. So, more than anything, they just get in the way. As you read, you’ll also find little tips and grammar icons that, when clicked on, will give you more information about how the language is used in that part of the dialog. Another useful feature. Each section isn’t particularly long. It won’t take more than a few minutes to read through. At the bottom of the story, you’ll find key words, and sometimes, a short 2-3 minute video. These can be quite useful but aren’t included for every section. There are some extra features that some will enjoy and others will completely ignore. Community – This section lets anyone ask a question or post whatever happens to be interesting to them. Ms. Bean, which is basically a representative of Manga Mandarin, will also ask questions. Maan Chinese Videos – Here you’ll find the videos that are also included in some of the lessons. Not all of them are listed here but I’m sure it’ll continue to grow. 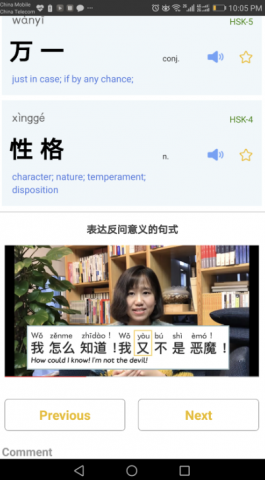 Favorites – You’ll find various sentences, grammar points, Chinese comics, and more that you saved while using the app in this section. You won’t be able to read full stories without paying some money. Each story has some free sections for you to read but also some blocked content. This lets you get a bit of a sample of the material but if you find yourself really enjoying a story, it’ll cost you some money to read it fully. There are two different payment options – buying beans or becoming a VIP. Manga Mandarin uses “Beans” as their currency. Why beans? I have no idea. 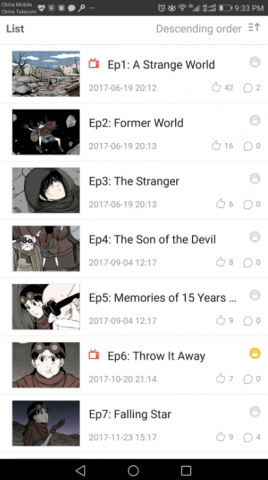 As you see the various episodes of each comic, some will be locked. Each episode costs 20 beans to unlock. Given how quick you can work through some of these lessons, the bean totals can add up pretty quickly. Still, a typical Mandarin comic with 10 episodes may have 7 free and 3 that need unlocked. $0.99 is a pretty reasonable price for that amount of content. You can see the cost of beans here which range from 60 beans for $0.99 up to 720 beans for $9.99. There are also opportunities to earn beans via signing in, referring users, answering Ms. Bean’s questions, and completing Chinese comics. Another option is to become a VIP. There are three different VIP plans that differ slightly. It’s not a perfect app and I think they’re still figuring things out. The biggest issue is that, while there are quite a few different stories, most of them can be finished rather quickly. It’s disappointing when you’re really interested in one of them, only to find you’ve finished everything available and are stuck waiting for an update. Still, this is something I’d expect to improve in time. The design could be improved, particularly the placement of the buttons while reading as they often get in the way. It’ll be interesting to see how Manga Mandarin develops over the next year or so. For now, it’s worth checking out, especially if you enjoy reading Manga, but even if you don’t, you may find it to be rather fun to use.